As I own a coin laundry with three television sets, the digital television conversion has been a particularly thorny transition. Admittedly, the coin laundry industry deals with a more complex matrix of considerations than would present themselves to consumers and most businesses. For example, the theft deterrent aspect of a tube television is of great benefit. For years, analog antenna reception has been a wonderfully worry-free proposition. It was cheap, reliable and yielded a high quality picture. Digital TV has been less successful. 1. Winegard offers an impressive array of products. 3. VHF/UHF/FM antennas are not great at VHF, UHF or FM. They are a compromise for everything. 4. Antennas are fairly cheap, very light and mounting bracket choices are plentiful. 5. Antennas are sharp and will cut you. 6. Distribution amplifiers from Radio Shack are worthless. 7. 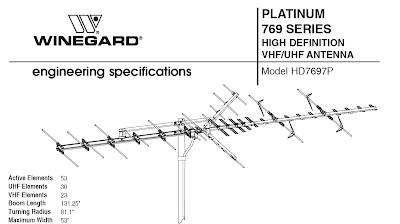 Mast mount amplifiers from Winegard help quite a bit. 8. KMEX channel 34 is a particularly popular TV channel. Interruption of that channel causes great aggravation. 9. KMEX Channel 34 is a particularly difficult channel to receive. 10. The digital TV signal is in the same frequency ranges as UHF/VHF. Therefore, a digital TV antenna is no different than a regular TV antenna. 11. The different length antenna tines are tuned to different frequencies. The short ones are for UHF. 12. UHF is directional, so if you are trying to tweak and peak UHF channels, like KMEX Channel 34, point the short tines towards the signal per antennaweb. 13. 300 ohm to 75 ohm converters are still required. 14. The true geeked out solution is to have a tall mast with separate VHF, UHF and FM antennas daisy chained together with twin lead wire. 15. Cable and satellite service for a business is about 8 times more expensive than the same service for home. 16. Electronic City in Burbank is always impressive and their knowledge of TV antenna technology is very robust. They are generous with good advice which is a great value. 17. Digital TV is a much more difficult signal to capture. Analog is much, much more forgiving. 18. It is very difficult to find digital tube TVs. 19. Mistake - trying individual powered 35db gain antennas on each TV because you think that you are over-splitting the signal is a bad approach. 20. Overkill it. Buy bigger antennas and taller masts. In the end, I have two masts, two VHF/UHF/FM antennas, 1 UHF antenna, a mast mount amplifier, 2 new Coby TVs, 1 new Coby TV that arrived DOA and 1 broken TV power switch caused by individual so angry that they couldn't watch the telenovelas that they hit the television with a stick.